Due to impending weather on Saturday the Baseball games have been moved to Friday at 1:00 pm. These will still be home games. 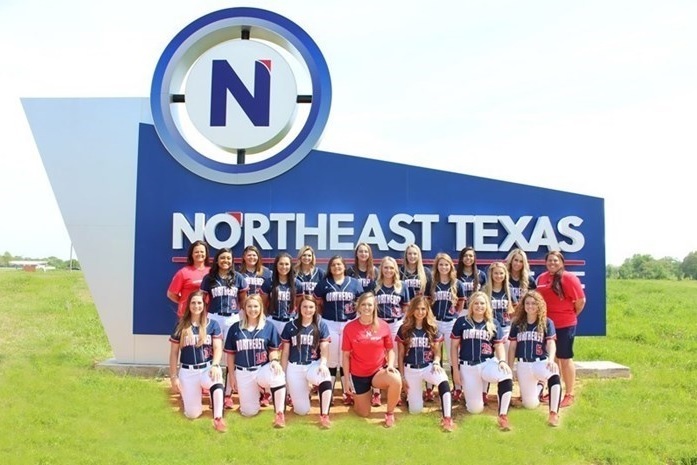 Northeast Texas Community College Softball (10-22, 5-11) traveled to Kilgore College (17-15, 7-7) Wednesday to make up the rained out contest from this past weekend. Kilgore took down the Eagles in game one of the doubleheader 7-5. Game two of the day saw the Eagles soar to victory by a score of 11-9 to earn the split with Kilgore College on the day. After giving up five runs in the opening frame, the Eagles roared back with 5 runs of their own in the fourth inning, but the comeback effort fell short, and the lost 7-5 to Kilgore College Rangers on Wednesday. After the Eagles tied things in the fourth inning, Kilgore answered with one run in the fifth and one in the 6th inning to end the comeback threat. The Rangers got things started in the first inning when Makenna Bell homered on a 0-2 count, scoring two runs. During the five-run fourth inning, the Eagles big inning was powered by a walk by Conci Adame, a single by Haley Chapa, an RBI groundout by Sydni Soileau, and an error on a ball put in play by Shelby Baker. Jamie Franks led things off in the circle for Eagle Softball as she allowed 13 hits and seven runs over six innings. Blakelea Nettles, Chapa, Haylee Wilson, and Baker each collected one hit leading NTCC’s offense in game one. In game two of the series, NTCC defeated Kilgore 11-9 in game two of the set on Wednesday after taking the lead late in the game. NTCC had Kara Carter in the circle for the Eagles. Carter had seven strikeouts on the day to earn the complete-game victory. The Eagles built a five-run lead in the fifth inning and then held off Kilgore’s late charge. The game was tied at five with Eagle Softball batting in the top of the fifth when Macee Hollins singled on a 1-2 count, scoring two runs. Kilgore got on the board in the first inning when the Rangers scored one run on a stolen base. The Eagles knotted the game up at five in the top of the fourth inning, when Shelby Baker singled on the first pitch of the at-bat, scoring one run. NTCC had 14 hits in Game 2 with Baker, Hollins, Blakelea Nettles, Brooklyn Manes, and Korbyn Bassett all collected multiple hits for the Eagles. Nettles, Hollins, and Baker each collected three hits leading NTCC to a series split. Baker, Hollins, and Bassett all had three RBI’s to drive the Eagles offense. Eagle Softball did not commit a single error in the field helping to secure the win. NTCC will return to action on Friday, April 12, when they travel to Paris Junior College for more conference action. Weather permitting you can catch the Eagles at home Saturday at 3:00 pm against Trinity Valley Community College.